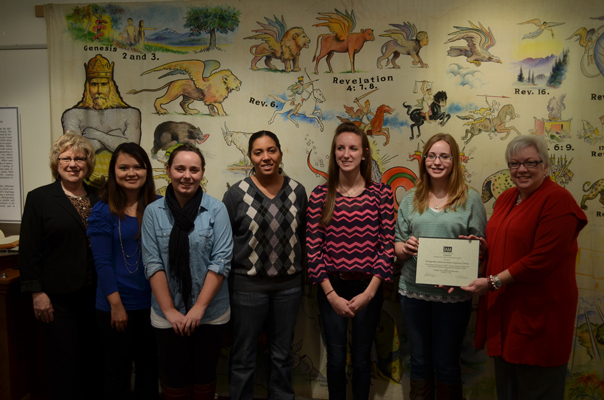 (Left to Right) Meg Bero, Director of the Schingoethe Center, and students of the AU spring 2012 MST2200 Museum Exhibitions course including Teri Nguyen, Sarah Mayberry, Amber Foster, Kayle Rieger and Laura Russman accept their Award of Excellence from Donna Sack, President of Illinois Association of Museums. AURORA, Ill. – In September, the Schingoethe Center added to its list of award-winning exhibits, receiving an Award of Excellence in Exhibitions from the Illinois Association of Museums (IAM) for “Unraveling Revelations: Decoding the Prophetic Charts,” an exhibit curated by students in the Aurora University spring 2012 MST2200 Museum Exhibitions course. On Monday, December 3, Donna Sack, President of IAM, visited the Aurora University campus to present the class with the award. In the early 19th century, a man named William Miller came to the conclusion that the Second Coming of Jesus Christ was imminent and would take place in 1843. On display in the Schingoethe Art Gallery are eight of the 36 charts from the Aurora University Jenks Memorial Collection of Adventual Materials. The charts were used as visual aids at church services and camp meetings to teach out the prophecies, which Miller believed were about to come to fruition. Bero wanted to give students the real-world experience of creating an exhibit from beginning to end. She acted as a guide throughout the process and allowed her students to explore the many facets of exhibit production. “Unraveling Revelations: Decoding the Prophetic Charts” will be on display through Friday, December 14, 2012, and is open to the public. Visitors can view the collection during normal gallery hours. Gallery hours are 8 a.m.–9 p.m. Monday through Thursday; 8 a.m.–5 p.m. Friday; and 1–4 p.m. Sunday.